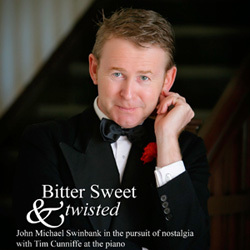 This debut recording by John Michael Swinbank and long-time accompanist Tim Cunniffe is the perfect addition to any classic music collection. The CD contains high quality studio recordings of 14 songs from the Master, Noël Coward and other composers including Oley Speaks, Cole Porter, Rogers & Hart, Ira Gershwin, Vernon Duke, and Stephen Sondheim. Click here for the track listing. You can purchase your copy of the CD for just AUD$25 (postage not included) by clicking here and completing the form. This ‘Royal Tour’ Teaspoon features the artwork of Sydney cartoonist Steve Panozzo and is a charming momento of the 2007/2008 production, Two Old Queens, which toured Perth, Adelaide, Melbourne and Sydney. No modern kitchen is complete without one of these – they are reported to make your cuppa taste even better! You can purchase a teaspoon for yourself for just AUD$10 (postage not included) by clicking here and completing the form. This original programme from Two Old Queens season at the Subiaco Arts Centre in 2008 is undoubtedly a collector’s item and includes 10 full colour pages, beautifully bound with ribbon! You can purchase a copy of the programme for yourself for AUD$10 (postage not included) by clicking here and completing the form.